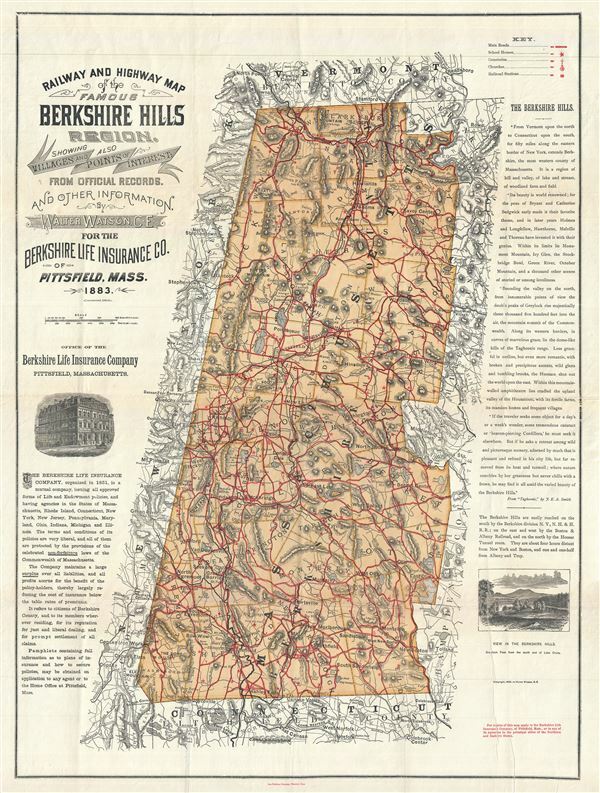 This is a highly desirable 1896 map of the Berkshires or the Berkshire Hills in Massachusetts, by Walter Watson C. E. It covers Berkshire County, located in the western most part of the state of Massachusetts. Parts of the neighboring states of New York, Vermont and Connecticut and the counties of Hampden, Hampshire and Franklin are also included. This highly detailed map notes railways, ponds, lakes, railroads, roads, and a host of other topographical features. Hills and mountains are identified throughout, with individual heights noted, and elevation rendered by hachures. A key in the upper right quadrant notes the locations of main roads, school houses, cemeteries, churches and railroad stations marked in red on the map. The map notes the location of Shays' Fight, the armed uprising of 1787, near South Egremont. Very good. Minor wear along original fold lines. Professionally flattened and backed with archival tissue. Minor printers crease lower right quadrant.